Head in the Cloud: "They Want The Shiny New One"
"They Want The Shiny New One"
I've just been reading this very interesting article from the New York Times entitled 'Inflating the Software Report Card'. It highlights the way educational software companies cherry-pick scientific research results on their products proving how they improve pupil performance. It also looks more widely at thorny issue of wether technology can really improve standards, not just improve levels of pupil engagement. Something I believe BECTA even struggled to prove. I've titled this blog "they want the shiny new ones" as it comes directly from a quote in the article by one of the software publishers, when referring to schools approach to purchasing equipment/software. This leads quite nicely onto a recent conversation I had with a deputy head of a primary school who was telling me about a conversation he had with an ICT co-ordinator in another primary school. They were both talking about Apple iPads in the classrooms, many schools now having or about to purchase these across our authority. The co-ordinator said this to him, after trying out an iPad with his pupils. 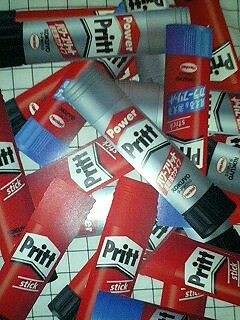 "Instead of spending £400 on an iPad, I'd get more use out of 400 Pritt Sticks!" Now, this wasn't from a 'long in the tooth', cynical primary school teacher. This was from a fairly young, tech-savy ICT co-ordinator. I actually felt quiet refreshed by this attitude, as I've seen too many schools jumping on the iPad 'band wagon' or other latest fad, without really having an idea what they are going to do with the new technology. Many just seem to want the 'shiny new one' without having an idea of what they want to do with it or whether their staff are ready for this technology. It would be better if some of them had a vision for ICT in their school, a plan on how to achieve that vision, and that they use the existing (and considerable in many of cases) ICT resources they had in their school effectively and fully first. Please don't get me wrong, I'm not an iPad hater, or any other technology solution, I just want schools to think about purchasing decisions and not be swayed by 'the shiny new one' unless it is right and appropriate for their staff and pupils.